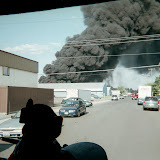 NARRATIVE: On Wednesday, July 2 2008 at 3:35 PM, 6 Companies of Spokane Firefighters, 4 Engines, 1 Senior Ladder and 1 Heavy Rescue Company under the direction of Battalion Chief Cornelius responded to a reported structure fire at 9 South Pittsburg. Within minutes, Engine 7 reported heavy smoke fire showing from the second floor of the multiple-use building as they left the station. The building is a large two-story building with basement storage, two commercial businesses on the first floor and multiple apartments on the second floor. As initial companies stretched pre-connected lines from Engine 7, the first ladder company fought their way to the second floor to evacuate residents and search for victims. When the first Chief arrived, he sized up the status of the fire and requested a second alarm due to the construction, potential for trapped victims and extreme heat (98 degrees ambient temperature at the time of the fire). The second alarm brought an additional Ladder Company, Pumper-Ladder, three engines as well as the SFD's Training staff, Red Cross, SFD's CARES and additional Chief Officers. The IC also special-requested three AMR ambulances and their supervisor de to the potential for residents to require treatment from the effects of the smoke and fire. Over the course of 40-minutes, fire attack teams extinguished the fire. Ladder companies searched the entire building removing occupants as they went. The building was ventilated and atmosphere was made tenable simultaneously. Rehydration and constant rotation of companies were necessary to prevent illness and injury of the firefighters from the extreme heat and conditions. SFD Training and EMS Staff personnel monitored firefighter's vital signs closely and aggressively re-hydrated them during the incident. The incident was under controlled within 90 minutes and no firefighters were injured during the event. District 9 and District 8 companies were called to staff two SFD Stations during the incident. PROBABLE CAUSE: The majority of damage was confined to the second floor apartment, unit number 6. The aggressive interior fire attack not only assisted in extinguishing the fire, it also provided Firefighters the opportunity to save the majority of the building and contents. The preliminary cause of the fire has been determined to be accidental--a young male using a flammable liquid during floor cleaning. Vapors from the flammable liquid found a pilot light which caused an explosive fire. The young male was identified by an officer from Rescue 1 and immediately treated by SFD Paramedics and transported to the hospital urgently. DAMAGE EXTENT: The majority of damage was confined to the second floor apartment, unit number 6. The aggressive interior fire attack not only assisted in extinguishing the fire, it also provided Firefighters the opportunity to save a large portion of the building and contents.